Simple, robust and comfortable everyday backpack in timeless Fjällräven style. The model was inspired by one of Fjällräven's many loyal users who redesigned his worn out Greenland jacket into a bag he could use on his kick-sled! The jacket's characteristics are seen in the two front pockets with bellows and smart folding constructions that keep contents in place when you have buttoned the flaps. Made from durable G-1000 HeavyDuty that protects contents and takes on an attractive sheen with age. The main compartment is top loaded and has a drawstring. The top flap is closed using a leather strap and metal buckle at the front. Inside the main compartment is a pocket for valuables and a compartment with a padded base for a laptop computer (up to 15 inches). 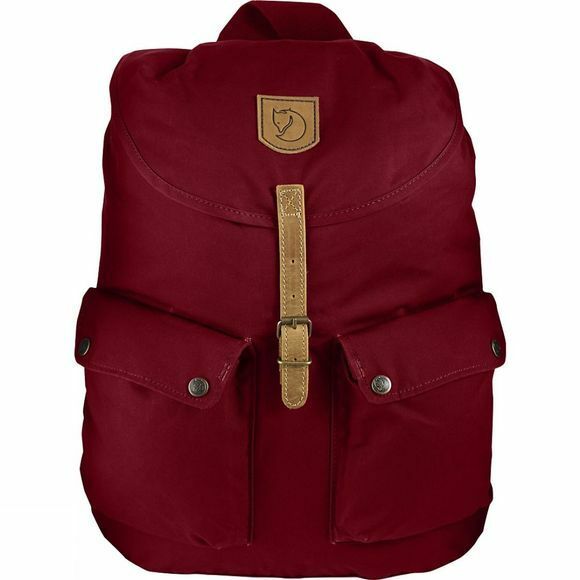 The back panel is padded and a wide, strong textile strap makes both handles and shoulder straps, the latter of which are adjustable for a good fit.